Included in the Gold List by Star Ratings Australia and in fact awarded the gong not only of best hosted B&B for the Fleurieu Peninsula but equal top best experience for all of South Australia. Welcome to Rosebank's addition, a spacious, modern two bedroom Cottage, with rich timber floors and eclectic furnishings, offering warmth, interest, comfort and class, all within walking distance of McLaren Vale's main street. A welcoming bowl of fruit and home-made cake or chocolates and a bottle of McLaren Vale's finest awaits you, as well as ample continental breakfast provisions, coffee and tea. Provisions for a cooked breakfast of eggs, bacon , tomatoes and mushrooms are also included.. Entrance to the cottage is from the southern deck which is accessed from the carport by a paved walkway. From the time you enter, the cottage will surprise and delight you. The open living/dining area with large TV, DVD player,sound system, couches and lamps open onto a north-facing decking with BBQ, table and chairs. You will find everything that you need in the kitchen - a stove and microwave,dishwasher, and a host of electrical appliances, an espresso coffee machine (and beans!). of storage space, luggage racks, overhead fans and reading lamps. Dressing gowns and extra blankets are also provided. The bathroom has a shower,and bath, heat lamps, great lighting and mirrors, hair dryer, scales and toiletries. There is a separate toilet. The laundry is equipped with a washing machine (and washing powder), clothes dryer, a portable clothes line, iron and ironing board. The second toilet is off the laundry. For your enjoyment there are books, games, CDs, DVDs, a picnic set and rug, beach towels and chairs. There is also an ipod alarm clock radio.The cottage does not have wireless internet to keep you connected but feel to use our own private internet facilities in our foyer or back verandah (next door). .
An ememrgency pack consisting of a first-aid kit, torch, candle and matches, fire blanket and extinguisher is located on the bottom shelf of the pantry cupboard. 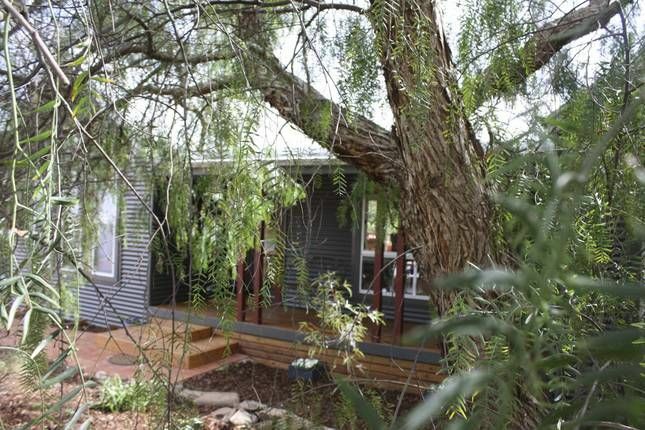 So if you wish to come away for a short break to renew and relax, or if you wish to discover our beautiful town and our glorious Fleurieu Peninsular, then Rosebank Cottage has everything you need. The Cottage (recently rated 4.5 Stars by AAA Tourism) is set in the heart of McLaren Vale with easy access to restaurants and wineries, walking trails and art galleries. and the main street. Or jump in your car and explore the Fleurieu and discover its hidden charms, its beautiful beaches, its majestic hills, the multiple golf course and national parks. Take a steam-ranger ride, explore Strathalbyn and its antiques, watch a whale on the south coast, take a flight in a vintage plane, enjoy a self-drive or chauffeurred winery tour, taste our wonderful olives and olive oil, follow the Art-Trail or simply revive and relax in our beautifully appointed cottage. The Cottage is fully equipped to make your stay as comfortable as possible. We have had the blessing of living in the best part of the world for the last 44 years. A background in education and hospitality and a passionate involvement in our area has helped us set up an accommodation experience that has received this year a score of 9.8 from Review Pro. Breville espresso coffee machine and coffee and a percolator and a bodum. Large north facing with great sun and wind protection and a great place to unwind. Three small steps to negotiate. Fantastic hideaway so close to shops, beaches and wineries! This was a lovely cottage, the perfect base for our family get-together. The house was well appointed, with comfortable beds, plus great air-conditioning and ceiling fans providing comfort on the hot days. The kitchen and fridge were generously stocked for breakfast provisions. The location was so quiet and peaceful, yet just moments away from the main shops and a few minutes drive to the beautiful beaches, even less to the wineries. Reg and Kay were terrific hosts. We would recommend this as a fantastic holiday home. Beautiful Place, had everything you need and within walking distance to the Main Street and Cafés. We had a fantastic stay at Rosebank Cottage. House was very welcoming and excellent kitchen, very clean bathroom and lovely living/bedroom areas. We just spent 3 nights with friends at Rosebank Cottage. This is a spacious, well furnished 2 bedroom B&B with all mod cons, set in a beautiful garden and surroundings in a quiet street within walking distance of the town and restaurants. The provisions provided were most generous and the kitchen is superbly set up. All in all this is a great spot to relax and enjoy the local wineries, restaurants and local beaches. We found the proprietors, Reg & Kay Cazzolato very friendly and helpful and will most definitely return. We stayed four days at Rosebanks and it really exceeded our expectations. The house is new, very comfortable and well appointed. We found homebaked banana cake, a basket of fruits, a bottle of terrific red as well as a fridge loaded with all we needed and more for our breakfasts. CDs, DVD, books, toiletries... no need to bring anything. The house is in a very quiet street, in town,close to the Shiraz trail. The beaches are just a few kms away. We loved the area and hope to be back one day. Thank you again for everything. Thoroughly enjoyed our time at Rosebank Cottage, very well equipped, relaxing and well located for local wineries, restaurants and shopping.Beds are fantastic.Would recommend Rosebank Cottage for a great getaway.